The Golden Trio has established strong experience in SA, and where the organization can grow to benefit the most students. Our goal for next year is to create an atmosphere in SA where students are welcome to bring their ideas and concerns forward. We are all willing to make students our priority and be the voices you need when speaking with administration. We hope to reconnect with our student body and ensure that their voices are heard. As TU goes into a new chapter, we are willing to to create changes that are beneficial for students. We are capable of reaching out to student organizations to see how we can grow into a unified campus. We want to encourage organizations to host larger and impactful events that can educate and move our campus forward. With doing so, we propose to create a time in our Cabinet meetings where any student can come to brainstorm ideas and collaborate with a SA department. This will create more community and a direct line to what students want to see at events. We hope to increasing transparency with the upcoming Financial Guidelines to ensure that students are capable of being creative and intentional with their programs. Being able to offer resources and an area for development for all organizations to promote facetime with students and bring a community feeling to campus. Visit the SA Polling booths in both the Student Union and the Pat Case dining center on April 11th & 12th. Vote Online by logging onto Harvey and clicking on the Student Association link on the homepage. Vote for Megan Skocdopole, Dhruv Varshney, and Michaela Conn! Megan Skocdopole: My name is Megan Skocdopole and I am running for SA President. I have served in SA over the past three years as an Associate Director of Springfest, Executive Director of University Events, and most recently as Chief of Staff. In these positions I have formed strong relationships with administration and the TU community. In my time in SA I have repeatedly educated myself on where the organization can grow and how our guidelines affect students. Our campus is starting a new chapter, and I am motivated to create a change that will be beneficial for our students. Student Association should be holding students up while listening to their ideas and encouraging them to push boundaries. As SA moves forward I propose to create a center where organizations can come for development and resources. Also for next year I am proposing that we allocate 15 minutes in our Cabinet so that students can come and brainstorm ideas directly with an SA department. This will allow us to increase engagement with the student body. Being a voice for all of our students, by listening and empathizing, is one of the biggest characteristics it takes to be President, and I am ready to help our campus progress forward. Next year, I want SA to create unity across TU’s campus and bridge the gap between all of our student groups. On this campus we are on one team, and SA should be alongside students. I plan to create a community that our students are proud to be part of, where they are the voice. Druv Varshney: My name is Dhruv Varshney and I am running for the position of Vice President. I have been involved with SA since my freshman year, serving as an Associate Director of Community Service, and as the current Deputy Chief of Staff of the Cabinet. As Vice President, I will be responsible for the operations of the Student Senate; your senators are the individuals that are supposed to represent you and your opinions to the administrators through legislation. However, Senate meetings often turn into a series of roundabout, close-minded discussions that disregard the student body at large. As VP, I hope to reconnect the Senate body to the students it serves by giving students a means to express their questions, ideas, and concerns. I plan to host public forums, in which students can come forward and ask their questions and present their ideas to senators; I plan to host more events like the Student Experience Council, in which general members of the student body, student leaders, and University Administration come together to discuss issues concerning the student experience at TU; I plan to utilize SA’s wide network of connections on campus and its resources to gain student input on potential policy changes and to give their feedback to University Administration. In my role as Deputy Chief of Staff, I have already made efforts to work towards these goals; I have planned and hosted two Student Experience Councils this year, and University Administration has acted upon our proposed ideas. Additionally, I have scheduled regular QnA sessions across campus to garner student opinion on several topics. As VP, my other most important goal will be to ensure that the financial allocations process is as efficient as possible. Going into the next fiscal year, the FA guidelines will be modified to reduce the restrictions that they currently contain. The new guidelines will allow all organizations, large and small, to be able to host impactful events. By guaranteeing a minimum of $1000 to each organization, small organizations will continue to be able host successful events. The new guidelines will also eliminate the $6000 allocation limit, allowing large orgs to further enhance their programming and reach even more students. If I am elected as Vice President, I will work towards making sure that your voice is heard by those that can effect change on campus and will act as a responsible steward towards the student activities fee that you pay—I hope that you’ll vote for me so that we can make TU better together! Michaela Conn: My name is Michaela Conn. I have been an active member of Student Association for the past three years serving as both an Associate Director and Executive Director of Graphics on Cabinet. Through my time in SA, I have developed a passion for creating a campus environment that is inclusive, open minded, and conducive to an enjoyable college experience. 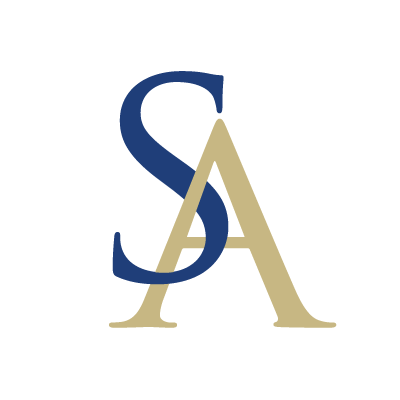 My desire for SA is to be seen as an avenue for students to reach administration and have their visions for their individual organizations and the campus as a whole, heard, debated, and put into action. For many organizations, their only interaction with SA is with Senate during the funding process. This process is often complicated and unclear creating a disconnect between SA and the student body. As Treasurer, I hope to transform SA into an ally for organizations in accomplishing their visions through increased transparency, flexibility and understanding throughout the funding process. Specifically, I plan to work closely with organizations to fully understand their goals for their organization and the campus as a whole. I want to ensure organizations are prepared for the funding process from start to finish, which will be especially important as SA transitions to new funding allocation guidelines. Dedicating time to organizations is crucial in reducing confusion associated with the process and will provide feedback for future improvement. If elected as Treasurer, my primary goal will be to build open relationships between SA and organizations in an effort to reconnect SA with the student body and work towards developing the strong campus community we desire. 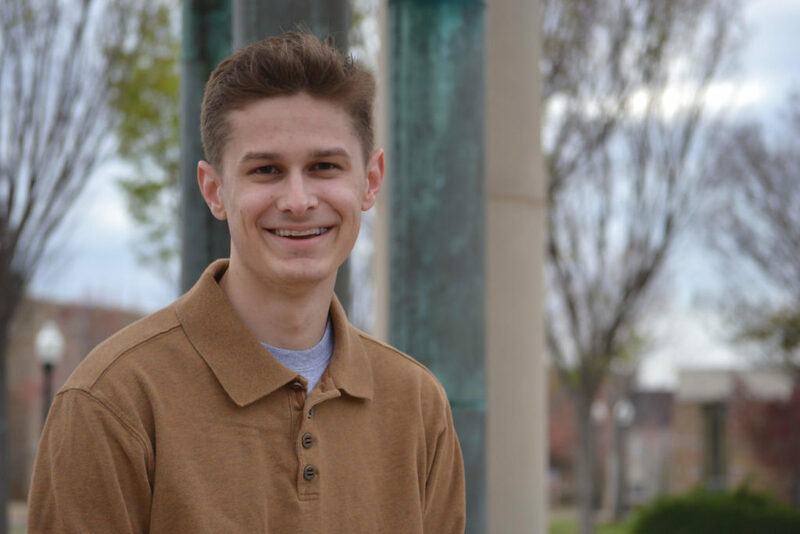 Conner Bender: My name is Conner Bender, an Accelerated Master’s student in the College of Engineering and Natural Sciences, and I am running to be your next SA President. I currently serve as SA Secretary, an Executive position. Previously, I have served in Technological Services and on the University Student Conduct Board. Lastly, I have chartered my own service organization and am a board member for a local non-profit. With this experience, I can jump right into making SA a place that makes us better people, neighbors, and students. I want to continually listen to your questions and concerns about SA. I believe that we can always improve from feedback and that in order to accomplish goals we must work with others. Allotting money toward Campus Security vehicles becoming handicap accessible and constructing a large hammock/canopy circle area are some other ways to improve the campus. How will this get funded? There is money in the Beneficial Change/Capital Expenditures section of the budget that we can tap into. To help with funding, the Department of Finance will work directly with the Business Office to absorb some of their workload—and avoid overlap—in order for organizations to get their money faster. Also say goodbye to SA website outages because the server will be migrated off of the OrgSpace system this summer. In short, I will drive more efficiency and catalyze events and real estate that promote diversity, personal/skill development, networking, awareness, and align with the TU Strategic Plan. Thank you for exercising your right to vote and taking the time to learn more about my ideas. Stay Golden and Reign Cane! Lauren Beatty: My name is Lauren Beatty, and I am running to be your next SA Vice President. I am dedicated to making your lives better both as members of the student body and of TU’s wonderful organizations. I have the experience necessary to do this job well. Previously, I was a member of the Cabinet’s Public Relations department and I am currently serving as a Senator and the chair of the University Improvements Committee. I am here to advocate for us, the students, to the campus’ leaders and Administration. Do you want to see improvements in campus living? Stronger connections between TU and the community? 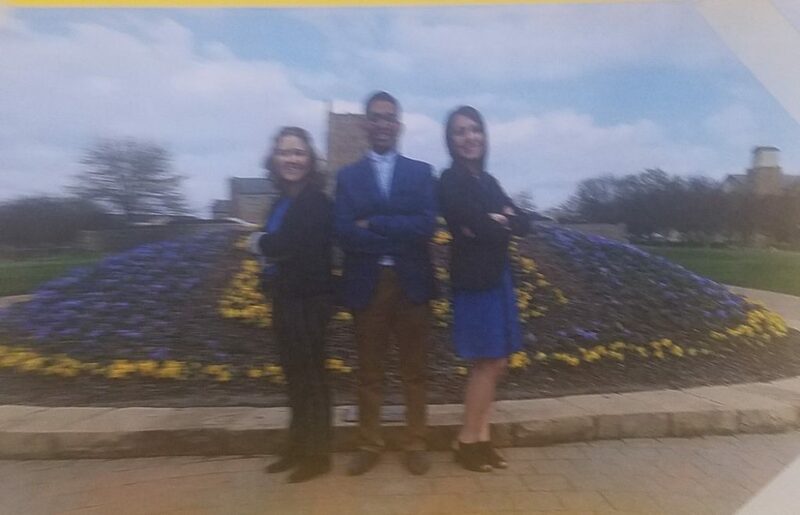 I want to work for the changes we need in order for us to have the best experience possible here at TU, and I have learned how to advocate for the students through my work as a Senator. I understand the challenges that we face when seeking help from SA, and as VP I intend to create easier ways for students to understand SA and its guidelines. To do this, I will work to create resources on the SA website to help you understand what Senate does and how it impacts our lives as students and as members of campus organizations. These resources should including short videos so students can visualize how Senate meetings work and know what to expect before attending a meeting. TU, help me make your lives easier, and make this campus an even better place. During my past two years in SA, I played a strong part in revising the FAC guidelines to ensure that campus organizations would not be unfairly penalized for technical mistakes. Having served as both a Senator and Cabinet member, I have a great understanding of the financial structure of both SA internally and externally, and how both can be improved. With that being said, I intend to dedicate my term to the growth of the student body, and hope I can count on your support. See you around and stay golden! Megan Sinik did not respond to requests for a statement by press time. The Student Association has the fiscal and temporal resources needed to effectively serve the greater student body of the University of Tulsa. The only thing missing is a willingness to do so. Since attending the university and working within SA, I’ve been disappointed by the “we’ve always done it this way” culture that has stifled change and prioritized the wrong ideas. I’m not interested in spending your student association fee on events to “hear your voice” or “communicate with the student body.” Your voice is heard each time you host an event and have to trudge your way through financial allocations. Your voice is heard each time you are handed a “free” t-shirt and then never wear it again. Your voice is heard when you vote for your executive representatives. 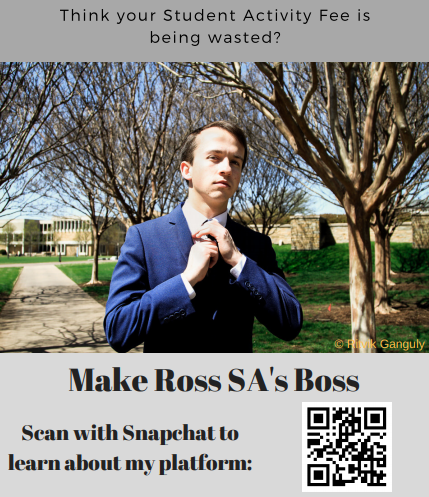 So this Wednesday and Thursday, I am asking you to write-in me, Ross Thompson, for the office of President of the Student Association. I hope to cultivate greater participation from the student body by leveraging our organizations with the highest aspirations. This means that the Student Association will use the resources of our tech services, graphics, and PR departments to partner with existing student organizations and promote these events. It also means that we would offer greater financial resources to meet the needs of our organizations. Rather than allowing the cabinet to operate as its own club, without the oversight of any outside organization, we would prioritize the ideas and events that excite and inspire students all across our campus. I won’t accept the status quo, and I hope you will not either. Make Ross SA’s boss.